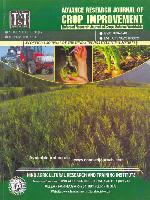 Advance Research Journal of Crop Improvement is an official publication of the HAS. It features the original research in all branches of Crop and other cognate sciences of sufficient relevance. The journal publishes three types of articles. i.e. Review/Strategy/Case Study (exclusively by invitation from the personalities of eminence) Research paper and Research Note. The manuscripts should be submitted in triplicate with CD completed in all respect to the Editor, ARJCI, 418/4 Numaish Camp, Muzaffarnagar-251001 (U.P.) INDIA. To facilitate an editorial decision on the acceptability, or otherwise, of their manuscript, and to speed-up subsequent publication, authors are strongly advised to consult the format of papers in a recent issue of ARJCI. Manuscripts should conform to the S.I. system for numerical data and data should be subjected to appropriate statistical analysis. On receipt of an article at the Editorial Office, an acknowledgement letter with a number is sent to the corresponding author. This number should be quoted or reproduced while making any enquiry about its status. ALL THE AUTHORS OF THE ARTICLE / PAPER MUST BE THE SUBSCRIBER OF THE JOURNAL. Review/Strategy/Case study: It should be comprehensive, up-to-date and critical on a recent topic of importance. The maximum page limit is of 16 double spaced typed pages including tables and figures. It should cite latest literatures and identify some gaps for future. It should have a specific Title followed by the Name(s) of the author(s), Affiliation: Address of the institution(s) where the research was undertaken and corresponding author with address. Research Paper: The paper should describe new and confirmed findings. It should not generally exceed 12 typed pages including tables/figures etc. A paper has the following features. Title followed by Author(s) and Affiliation: Address of the institution(s) where the research was undertaken. Each paper must start with a brief but informative and broadly understandable Summary / Abstract. Key Words: Maximum five-six keywords to be indicated. Introduction: A short introduction of the research problem followed by a brief review of literature and objective of the research. Materials and Methods : Describe the materials used in the experiments, year of experimentation, site etc. Describe the methods employed for collection of data in short. Results and Discussion : This segment should focus on the fulfillment of stated objectives as given in the introduction. It should contain the findings presented in the form of tables, figures and photographs. References: Reference to literature should be arranged alphabetically and numbered according to author's names, should be placed at the end of the article. Each reference should contain the names of the author with initials, the year of the publication, title of the article, the abbreviated title of the publication according to the World List of Scientific Periodicals, Volume and page(s). In the text the reference should be indicated by the author's name in bold, followed by the year. Research Note: The text including table(s) and figure(s) should not exceed five pages. It should have a short title; followed by name of author(s) and affiliation and references. There should be no subheadings, i.e. Introduction, Materials and Methods etc. The manuscript should be in paragraphs mentioning the brief introduction of the topic and relevance of the work, followed by a short description of the materials and methods employed, results and discussion based on the data presented in 1 or 2 table(s)/figure(s) and a short conclusion at the end. References should be maximum of seven in Nos. at the end. a) Three computer printed copies of the manuscript, printed on one side of A4 size paper with proper margin. · Processing fee Rs. 100 per research paper/article. · JOURNALS ANNUAL/LIFE SUBSCRIPTION FEE FOR EACH AUTHOR. · At the bottom of first page, Postal address of the corresponding author and co-author(s), and also Departmental address with designation, Tel. No. Fax No. and E-mail ID etc. must be specified. · Article forwarded to the Editor for publication is understood to be offered to the Journal exclusively. It is also understood that the authors have obtained a prior approval of their Department, Faculty or Institute in case where such approval is a necessary. Submission will also imply that all named co-authors have agreed to the work been sent out for peer-review and possibly published, and that they have no undeclared competing financial interests. · Acceptance of a manuscript for publication in the Journal shall automatically mean transfer of copyright to the Society. The Editorial Board takes no responsibility for the fact or the opinion expressed in the Journal, which rests entirely with the author(s) thereof. · Author Page Charges: Because of the high cost of publishing articles in the Journal payment of page charges is mandatory and charges are subject to change without notice. Current charges are Rs.200/- ($8.00) per printed page (A4 Size, approx. 800 words). For further details please contact on society’s website. · Common causes for the papers being rejected are: (i) that they report a single small or incomplete experiment that makes a minor or uncertain contribution to new knowledge or understanding. (ii) that the data are statistically insignificant and / or do not support the claims being made, (iii) they are written so poorly, without references to these and the more detailed instructions for authors, that they are incomprehensible. Authors are requested to send their research articles strictly according to the format mentioned in the Guidelines to the authors.